Northport Harbor - a cruiser-friendly destination on the Western LIS! Inside Huntington Bay off Eaton’s Neck is a remarkable destination and our personal favorite on Western Long Island Sound. Why? Because it’s got protected anchorages, great swimming spots, lovely shoreline, lots to do, and one of the few easily accessible and lovely waterfront towns on the Sound. The entrance to Northport Bay is in the Southeast corner of Huntington Bay. The water is pretty deep along the shore from Eaton’s Neck where the big Coast Guard facility stands ready to protect us from disaster. As you reach the far shore, the well marked though narrow entrance runs to the East, with swift flowing current through the channel and lots of fishing vessels and traffic passing through it! Approaching Huntington Bay from Long Island Sound, one either passes by Oyster Bay from the West or Port Jefferson to the East. On first inspection, it appears that the Bay ends abruptly, but as you go farther into the Bay, you'll note several channels opening up into several protected harbors. To starboard is Lloyd Harbor, a peaceful anchorage. Next is the crowd in Huntington Harbor, accessed by a narrow channel. Then comes a sharp turn to port through an entrance to another broad water harbor. Just to port as you enter is Price Bend, an anchorage that is one of the easiest havens to reach when you need to tuck in for the night. Just beware of the old bunker that sits like an island off the beach. Mid-summer the place is jammed with boats, but there is usually enough room for all to share. Most of the powerboats head close in to the shore, and children and dogs will be seen frolicking along the public beach and exploring the bunker. It’s a great place to stretch your legs or try a little surf casting on the bay side of the sand spit. Just beware of poison ivy and campers on the hill. Entrance to Northport Harbor in the distance with Price Bend anchorage to the far right. A bit farther in toward the unmistakable Northport stacks (four candy cane striped towers of one of the largest power plants around) is Duck Island which does have a very protected anchorage. Be aware of the fast drop in depths there, as well as the lore that the locals don’t particularly care for uninvited visitors! Across from there is Centerport Harbor. It is here on Little Neck that the Vanderbilt estate, Eagle’s Nest, sits as a natural history museum, planetarium, and mansion open to the public! The collections contain over 12,000 documents and images on the life and interests of Willie K. Vanderbilt and 30,000 artifacts in the museum. An accomplished sailor and naturalist, Willie K. traveled the world collecting and cataloguing specimens that he brought home to display. And they are still here on Long Island in a museum for all to see. What's even more fascinating is that the curator for his collection, William E. Belanske, was the same man who later created the Museum of Natural History in New York. It's unlike any collection we've ever seen, and probably contains specimens of many species now extinct. We were completely blown away by this treasure on Long Island's Gold Coast. More recently, a planetarium  the only one on Long Island  opened on the grounds. The mansion itself houses an amazing collection of historical items (516-854-5555). The web site http://www.vanderbiltmuseum.org/flash.html lists the following among the collection: more than 1,000 books on exploration, natural history and the decorative arts, scientific journals, 15 scrapbooks, over 5,000 black and white photographs documenting Vanderbilt's family life and scientific explorations, and architectural plans and photo albums of the Centerport, L.I. and Fisher Island, Florida estates. Log books from Vanderbilt's around-the-world expeditions document his experiences and the people and places he visited during the 1920s and 1930s. Over 300 original pen-and-ink and watercolor illustrations of marine specimens by Vanderbilt's curator during the expeditions, are preserved. Original, one-of-a-kind photos and documentation of the Vanderbilt Cup Races on Long Island (1904-1906, 1908-1910) and the building and history of Vanderbilt's Long Island Motor Parkway are also preserved. We did find the memorial wing, a tribute to his son's tragic early death, a bit creepy but indicative of the depth of Willie's sorrow. The fish hall, in one of the outbuildings of the Vanderbilt mansion museum. If you can tear yourself away from Eagle’s Nest, a wonderful shoreside town beckons. As you make the turn into Northport Harbor, Northport Yacht Club sits to port and has guest moorings available. 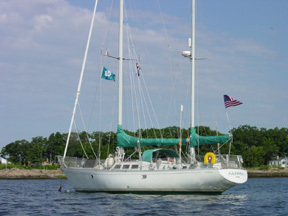 Centerport Yacht Club is to starboard and also has guest moorings. CYC is more convenient for a visit to the Vanderbilt estate, whereas NYC is more convenient for a jog into town. If you're lucky, the launch drivers of the yahct clubs might even drop you at the town dock upon request. We tend to anchor out and dinghy into the main town dock. The dock actually has free tie-up for vessels large and small, but the tides are a bit of a challenge; because the dock is fixed, you must accommodate the tidal variation in your line setup and climb up a ways if you arrive at low tide. There is no real dinghy dock for transients, but the dinghy dock for locals can accommodate you for a short shore visit (per the harbormaster). Just be sure not to lock your dinghy to the float or you may find your lock cut by a fisherman who had to get past you to get to work. Alternatively, you can park at Seymour’s, just a short walk from town. They have moorings, launch service, a fuel dock and ice, too (VHF ch 68 or 516-261-6574). Inner harbor from Northport Yacht Club. Once ashore, there’s plenty to do, with crafts and antiques shops, a great hardware store, and lots of restaurants to choose from all in about a three-block radius of the harbor front. The harborfront itself is quite lovely with a nicely maintained park, band shell for concerts, and view up the main street. Make reservations for dinner because the popular places book up early. Try The Main Street Café for moderately priced pasta and veal specialties in a delightfully cozy atmosphere. For a great Bloody Mary, try Skipper’s Pub, and breakfasts at the Shipwreck Diner are a real treat. Ask to be seated on their outdoor patio in good weather. There’s also a phenomenal gourmet deli just a few doors down that has one of the largest selections of cold beer we’ve seen anywhere! It’s a place we have no problem visiting over and over. Seymour’s was once a major oyster shack and you can see a photo of the oyster schooner fleet anchored just off Seymour’s at the Northport museum towards the upper end of Main Street. There you can also learn about Jack Kerouac making his home in Northport and why the town was once called Cow Bay! You can also see remnants of the sand dredging and ship building industries that once made Northport a bustling waterfront metropolis. Vanderbilt Mansion and Museum 180 Little Neck Rd. The Great Cow Harbor 10K Visit the website for information. Antiquing Numerous shops all along Main Street. Visit the village websites for more info. Clockwise from top left: Dinghy dock and main town dock at the foot of Northport, Centerport Yacht Club, Northport Yacht Club, and the Willie K. Vanderbilt estate.